What does a captions file look like? Which platforms support SRT caption files? How do I produce written transcripts instead of captions? What other captioning tools are available? In 2016, Digiday reported that 85% of Facebook video is watched without sound. A similar stat will apply to other social platforms. Often, this is because autoplay is turned on and people tend to scroll on past unless the content really grabs their attention. Average reach of a captioned video was 16% higher than the same video without captions. You’ll have a better chance of making people watch your content if your videos contain captions, especially if there’s something appealing in the first caption. is in a shared space and can’t turn the sound on. can’t understand the person’s accent. is not a native English speaker. Even if none of the above applies, captions give a more polished, professional look to a video – and that could serve to keep people engaged and increase the time they spend watching your content. Captions files are plain-text files. The most popular format is SubRip Text (SRT), probably because this is the format supported by Facebook and LinkedIn. Another popular format is Web Video Text Tracks (WebVTT or VTT). SRT and VTT files are almost identical, so I’m going to focus only on SRT. This snippet shows numbered scenes, start times, end times and the text to display in each scene. You could create such files manually but that would require a lot of effort. There are much better ways of creating captions, so read on to see what suits you. This should work for anyone creating captions in English. Open captions are part of the video file. They are “burned in” to the video, which means they’re always visible. The viewer has no choice whether or not to see the captions. Closed captions are not part of the video file. They’re uploaded as a separate file (usually in SRT format) along with the video. They’re optional and the viewer can turn them on or off using controls on the video. With open captions, the video creator has control over the placement, size and style of the captions, depending on which tool is used to add the captions. With closed captions, the display is determined by the platform hosting the video. For example, closed captions look different on YouTube from how they do on LinkedIn. I create my captions by sending my videos to Rev. Their captioning service costs $1 per minute of video, and it’s quick and accurate. I’ve often received Rev captions back in under an hour, and rarely have to make more than a couple of edits to the text. Publish your video as normal on YouTube or Vimeo. Go to Rev and supply the link to the published video. Sign in and pay as prompted. Wait for an email containing the SRT captions file. Upload the captions file to YouTube or Vimeo. View the video in YouTube on a desktop browser. Click Other features | Translation & transcription. Click Add new subtitles or CC. Click Choose file and select the SRT file. Edit the captions if needed and click Publish. View the video on a desktop browser. In Enable Captions & Subtitles, browse and select the SRT file. Tick the Status box to set it to ON. Set the type to Captions. If you don’t want people to see the video until your captions are ready, publish it as a private video YouTube or Vimeo and then make it public after you’ve completed the above process. If you haven’t published your video at all but still want captions for it, you can upload your video direct to Rev. If you don’t want to use a captioning service, you can get YouTube to create free captions on your videos. You’ll need to edit the automatically generated captions and then you can save the SRT file for reuse elsewhere. Here’s a quick step-by-step process for editing and downloading the automatically generated captions in one of your YouTube videos. Go to the settings page of one of your videos, and then click Subtitles/CC. If you don’t see this, it’s probably because the video is brand new. You usually have to wait at least 15 minutes before automatic captions appear. Make changes to the caption text to the left of the screen. Make changes and then click Publish edits. You should now have two sets of captions, as shown below. The automatically generated version can now be deleted. Click Unpublish on the following page. This should leave behind only one set of captions. Finally, in the Actions menu, click .srt to download the SRT file. You can use the SRT file when uploading the same video direct to Facebook, LinkedIn, Vimeo and anywhere else that supports this format. Although this method really is free, the time it takes you to edit the auto-generated captions may not make it worthwhile. I’d guess it takes around 10 minutes to brush up and resave your captions in this way. For me, it makes more sense to spend a couple of pounds to outsource that task, and that’s why I send my videos to Rev. You can add live captions to videos as you record them on your iPhone or Android phone. This is great for social media, because most video there will play with the sound off by default. Adding good captions will improve the chances of people watching the content. The good news is that you don’t need to write your own captions or even use a captioning service to do the work for you. The big-name omission here is Twitter. Their lack of support for SRT captions stops me from sharing more video content there. Let’s say you have a captions file for your video (see The time-saving method for creating captions) and you want to add this when uploading a video direct to LinkedIn. Create a LinkedIn video post and upload an MP4 or M4V video (see note below). In the top-right corner, click the pen icon. Browse for the SRT caption file. Once the video is processed and published (it can take a few minutes), the captions will be displayed automatically when the video is played. The prompt for captions appears only if you upload an MP4 or M4V video file. If you save a video from your mobile phone to your desktop computer or laptop, it might be saved in MOV format. If you upload this to LinkedIn, you won’t be prompted to add captions. Workaround: convert your MOV file to an M4V file using the free media.io tool for Windows and macOS. The CC icon shows that the video contains captions, and captions are displayed by default. Clicking the icon turns the captions off. There are no styling preferences available, so you can’t change the colour, size or type of text shown in LinkedIn’s captions. The default style of white text on a black background looks pretty good to me, though. If you have a captions text file, you can import the captions to an existing video by using video-editing software such as Camtasia. Then you can export the video with the captions burned in. If you have a pre-written script for your video, you can copy it into Camtasia. Camtasia lets you add a special captions “track” to your audio, and this is used to type your captions or paste them in from pre-written scripts. If you have an SRT file handy, you can import it direct to Camtasia. If you’ve used Camtasia to create caption content from a pre-written script, you can export the captions alone (in SRT format) via the Share | Export Captions… menu. In general, adding captions manually like this isn’t a good use of your precious time, especially when you can get a captioning service to do it more quickly and cheaply (see The time-saving method for creating captions). Let’s say you have an SRT caption file and want to add it to an existing video, but you don’t want to mess around with Camtasia. What do you do? Good news: you can add your SRT captions to an existing video by using HandBrake. It’s free and works on Windows and macOS. HandBrake lets you produce a captioned copy of the video without overwriting the original. Open the video (MP4) file in HandBrake. Use the Save As and Browse options to set the destination of the new captioned video (don’t overwrite the original!). The downside with HandBrake is that the captions don’t look great when they’re burned in to the video. The resulting white text with black shadow is fine if your video is naturally dark but quite poor if your video has a light background. 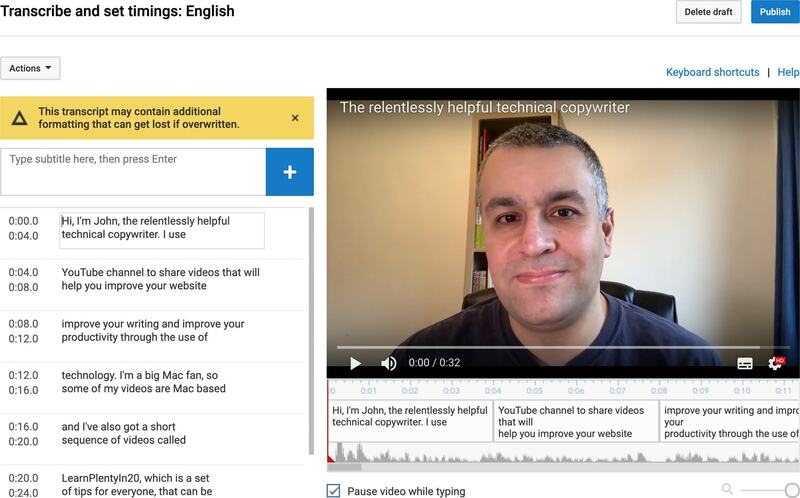 While captions go in the video, written transcripts can go anywhere to accompany the video. To create these written transcriptions, try a service such as Temi. Your first use is free and then it’s $0.10 per minute of video after that. You have to upload your video file, which is a pain if it’s a biggie. Here’s a sample of the results you get from Temi. If you want to see how well Temi performed in this test, watch this video and compare it with the full transcript. Rev also has its own transcription service. Here are some further captioning tools. I’ve tried these only briefly and am listing them in rough order of preference. The auto-captioning results from Headliner weren’t great, and the download file is in VTT format instead of SRT. PS. I’m not called “Ron Jon”. In Kapwing, the Add Subtitles to Video option allows you to upload a video and auto-generate captions for it. You can edit these and then download the resulting video file with the captions embedded. You can’t download the captions on their own, and the video file will come with a Kapwing watermark. Captions are relatively quick and cheap to add to your videos. I use Rev and it costs only $1 per minute of video. If you’re creating videos on your iPhone for social media then live-captioning via Clips means you can do the job without spending anything at all. With video consumption on the rise, people are going to expect more video to come with captions. Get onboard now and use captions to improve the way your audience experiences your video content.